As you may know, life tends to throw us a few changes here and there. One of the major changes I’ve had to deal with was having to work out of my home. My office used to be about 8 miles away and I’d commute there with my bike. But now that my commute is literally a few steps away from my bedroom, I surprisingly get more riding done now than I did in the last 4 years. Not sure if you know what it’s like to work from home, but you can get a bit of cabin fever. I know for myself I need to get out once in a while, interact with people, breath fresh air and get some sun. If you can relate to any of those, then here’s some things that I do to help me get my bike “fix” on. 1. I often have meetings at Starbucks about 2 miles away. I’ll hop on my bicycle and ride there. 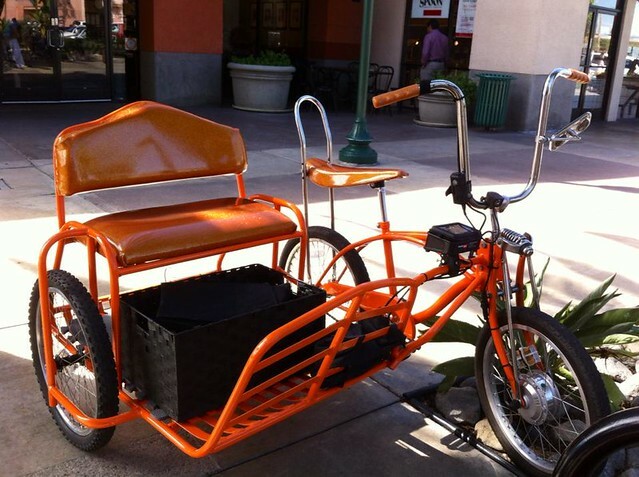 In fact I once took the sidecar to my meeting and my client was so impressed by this machine. However, I couldn’t convince him to go for a ride with it. 2. I go out for lunch. I’m in between Downtown Brea and Downtown Fullerton, so that means I’ve got plenty of choices to eat at. I also will arrange lunch dates with various friends who work or live in the area. 3. I run errands with my bicycle. If I’m out of ink for my printer or need more coffee beans or have to run to the bank, the bicycle is much easier than having to use my motorcycle or car. I actually use my motorcycle quite a bit. I do so when I have to run longer errands. But doing so poses it’s own challenges. With a motorcycle, I have to get on all my riding gear, get it out of the garage, make sure there’s gas and by the end of it, I smell like fumes…but it’s still better than having to take the car around town. So if you work from home, you can still be a bike commuter. Just find ways to use your bicycle when you have to get out of your home. Good tips. I commute each day to the local university where I’m taking classes, and have been considering switching to an online program. Nice to have some strategies.